Prevent car chemicals and motor oil from winding up on local beaches or in drinking water. Many of us believe we save money by washing our own cars and changing the oil ourselves. But do we really? Have you ever calculated the number of gallons of water you use and estimated how much it costs? You'd be surprised that you may not be saving all that much. And, on top of it, you're adversely affecting the surrounding environment and adding to the cost of potential environmental clean-ups. Most citizens are not aware that by washing the grime off their vehicles, they are polluting the environment. When cars are washed on streets and driveways, dirty water enters storm drains and eventually winds up in rivers, streams, creeks and lakes. Car detritus, along with detergent-rich water used to wash the grime off cars, has been characterized as one of the major nonpoint sources of heavy metals, oil and grease, and other components, such as rubber. Collectively, car washing activity adds up to big problems for our local lakes, creeks and streams. Dirty water containing soap, detergents, residue from exhaust fumes, gasoline, heavy metals from rust and motor oils can wash off cars and flow directly to storm drains and into the nearest creek or stream where it can harm water quality and wildlife. Washing your car is only a problem if you don’t know where or how to do it correctly. 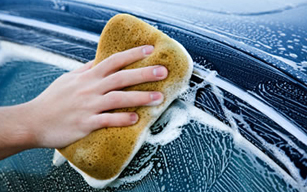 The best way to minimize the effect washing your car has on the environment is to use a commercial car wash. The average homeowner uses 116 gallons of water to wash a car, while most commercial car washes use 60 percent less water for the entire process than a homeowner uses just to rinse the car. And, most locations reuse wash water several times before sending it to a treatment plant. Use only biodegradable, phosphate-free, water-based cleaners. Use a high-pressure, low-volume hose with a trigger nozzle to save water. Wash on an area that absorbs water, such as gravel, or grass, which filters water before it enters groundwater, storm drains or creeks. Avoid washing cars on concrete or asphalt pavement. When planning a car wash fundraiser, try developing a partnership with a commercial car wash facility or have the cars washed on a permeable surface. Always empty wash buckets into sinks or toilets. Never dump motor oil, antifreeze, transmission fluid or other engine fluids down storm drains, into road gutters, on the ground or into a ditch. When oil leaks from our cars onto driveways, streets and parking lots, there’s a good chance it will be washed into nearby storm drains, eventually making its way into our streams, ponds, reservoirs and estuaries. Picture the number of cars in your area and imagine the amount of oil that finds its way from leaky gaskets into our water bodies. Used oil from a single oil change can pollute up to one million gallons of freshwater. Improper disposal of used oil, which includes oil leaking from cars, contributes significantly to stormwater pollution. The EPA estimates that American households generate 193 million gallons of used oil every year and improperly dump the equivalent of 17 Exxon Valdez oil spills every year. Check your car often for oil and fluid drips and other leaks and fix them promptly. Have your car regularly tuned-up to reduce oil use. Use ground cloths or drip pans under your vehicle it you have leaks or are doing engine work. Recycle used motor oil. Many auto supply stores, car-care centers, gas stations, and some public works facilities, accept used motor oil. Clean up spills immediately. Use kitty litter or sand to soak up the liquid. Properly dispose of this material after the spill. Collect all used motor oil in containers with tight-fitting lids. Do not mix waste oil with gasoline, solvents or other engine fluids. This contaminates the oil, which may otherwise be reused and may form a more hazardous chemical.